Directions (1 – 10): In the following question, the parts of the sentences are named as (A)-(E). One of these parts may or may not contain an error. From the alternatives given below, choose the error-less combination. If there is no error, choose the 'No Error' option. 1. E) There is no grammatical error in the given sentence. Therefore, the correct answer is option E.
2. A) 'In hopes to' is an incorrect usage of the phrase that is meant to represent a hopeful desire for something. 'In hopes of' or 'with hopes to', would be the correct usage in the part C. So, the options that contain C would be incorrect. Hence, correct answer is option A. 3. C) The sentence suggests that a process of consideration is taking place; which suggests that the correct tense to be used in B must be present perfect, since the activity has occurred in very recent past. So, the past perfect form 'had' is incorrect here, since it points to an activity committed in a distant past. Since sentence B is incorrect, the option that does not contain it must be the answer, i.e., option C.
4. E) There is no grammatical error in the given sentence. Therefore, the correct answer is option E.
5. B) The sentence uses the simple past tense verb 'opened'. The part C uses the 'has been', which is the perfect continuous form, when used with a verb +'ing'. But, the verb uses the past tense/past participle form 'redefined', which is incorrect. So, the option must not contain the erroneous part C. Therefore, the answer is option B. 6. B) Whenever there is a use of the conjunctive 'unless' to join two sentences, one of them must be conditional upon the other. But; the sentence preceding the conjunctive seems to be complete and meaningful without the E part. Also, instead of 'unless', which indicates a negative tone, the correct conjunctive should be 'as' or 'because', which support the intended meaning. E part, the, becomes unnecessary, therefore, the correct answer is option B. 7. E) Whenever sentences are given that include punctuation marks such as commas(,) or semicolons (;) etc, special attention must be paid to the construction, as these can point to an error, if any. The given sentence seems to have no grammatical errors, hence, the correct answer is option E.
8. D) The sentence is referring to the 'fresh concerns', which is a plural doer of the action; so the corresponding form of past participle should be the plural 'have' and not 'has'. The part A has an error, so the answer must be combination BCDE, which is not given. Therefore, the correct answer is option D.
9. C) Accordance is a noun form of the verb 'to accord', which means to agree or conform. The correct way to use accordance is 'in accordance with' or 'with accordance to' (which is an archaic English form and not used too much). So, part A has an error. The option which does not contain A must be the correct answer, which is, option C.
10. 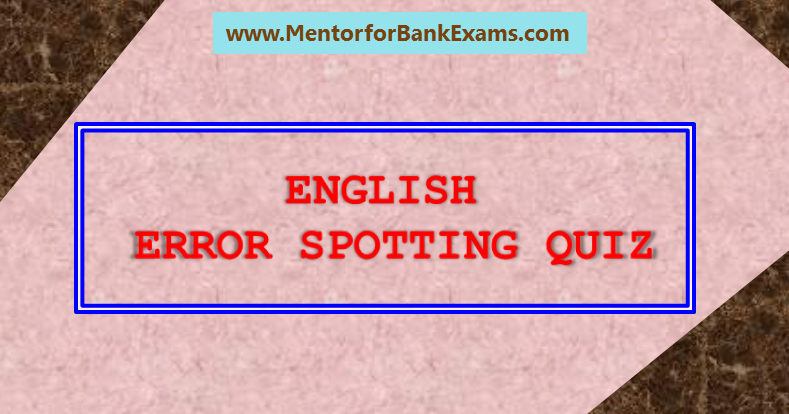 C) The sentence gives the definition of banks and in part D, the preposition used is 'of', which is incorrect. The correct preposition should be 'for' or 'in', in order for the sentence to be meaningful. So, the combination which does not contain D must be correct, viz, Option C.